Wacky, weird, wild and very much worth reading, Dali’s Moustaches is a roller coaster ride through the life of the eccentric and outrageous mustache antics of a Spanish painter who reached superstar status all over the world. Or perhaps better said, whose mustache reached superstar status all over the world. Not so much a scholarly monograph, although the subject certainly warrants one, Dali’s Moustaches is better described as a montage of bits and pieces, illustrations, quotes, and insights from every era of Dali’s extraordinary life, which spanned a good 85 years from 1904–1989. This book should not be confused with the similar titled Dali’s Mustache that Dali published with his photographer friend Philippe Wheelsman in 1954. Starting with the first chapter the reader is told the story of Dali’s wacky parents, who named Dali after his older brother, Salvador, who died at the age of 18 months, a few years before Dali was born. Dali never could reconcile internally whether he was Salvador himself or Salvador his older brother, and Dali carried this confusing consternation his whole life. The reader follows Dali, as if on some bizarre scavenger hunt, in search of himself. Dali would stop at nothing to launch a new trend, make a statement, spew his opinions, flaunt his genius or unleash his insecurities. He dappled in various obsessions with: theater, film, and writing; the Surrealists, the Marxists, and the Freudians; the masculine, the feminine, and the androgynous; the obscene, the absurd, and the offensive—to name just a few. All with the sole purpose of finding out who he really was, if anything at all could ever be really real (or surreal, or anti-really-surreal), and letting the world know how it was all going. One might think Dali was just being egocentric if not for the sympathy felt for a disillusioned charismatic. In the midst of it all, Dali’s mustache grew and grew, morphing into what Dali referred to as a mystical antenna through which he could, “receive information from the atmosphere and channel it into his work . . . It enabled him to perceive his surroundings more intensively and completely.” As if the world was lacking a more intense version of Dali, Dali focused on his mustache. He wanted to create a mustache-driven frenzied reality that would outlive his own lifespan. This approach seemed to have worked. Somehow, during his escapades, his weird and offbeat schemes reached a massive audience. Not only did he paint, and write, and engage in creative projects with famous colleagues all over the world (Walt Disney, Groucho Marx, John Lennon, etc. ), Dali and his mustache were also on a wild, lucrative tour of the world of commercial advertising. He and his mustache were so in demand that he received an average of 500 offers a year to promote various products. Everything from crutches and clocks, to men’s cologne and cognac bottles, was fair game. In 1970 his mustache earned one million dollars per minute on a French chocolate commercial that took ten minutes to shoot making him one of the highest paid painters of the day. Dali once commented that the, “audience mustn’t know whether I’m spoofing or being serious; and likewise, I mustn’t know either. I’m in constant interrogation: where does the deep and philosophical Dali begin, and where does the loony and preposterous Dali end?” So, after being captivated by the surreal shenanigans of Dali’s all-consuming personality, one arrives back into the concrete pages of Friedewald’s book, which one almost forgets is being held in hand. Friedewald, gratefully, does live in our reality. 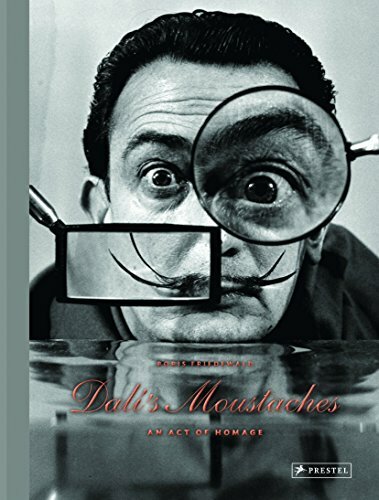 He has thoughtfully included many practical elements in his book, including a well-organized and helpful biographical timeline, a recommended readings biography of sorts, and a striking illustrated chronology of Dali’s mustache itself. He has done a remarkable job of taming a wealth of loony and preposterous Dalian information into a fun, well presented, and entirely manageable package.